When ASUS launched the Zenfone series last year, I could not believe the price. The first-generation Zenfone were well built, value for money, and a feature-packed new UI. Zenfone 2 series continue with the value-priced proposition, and to delight the power users, ASUS has extended the product range with premium specs but still priced below S$500. This strategy has worked: I have never seen such high take-up rate among my peers and colleagues other than iPhones and Samsungs. 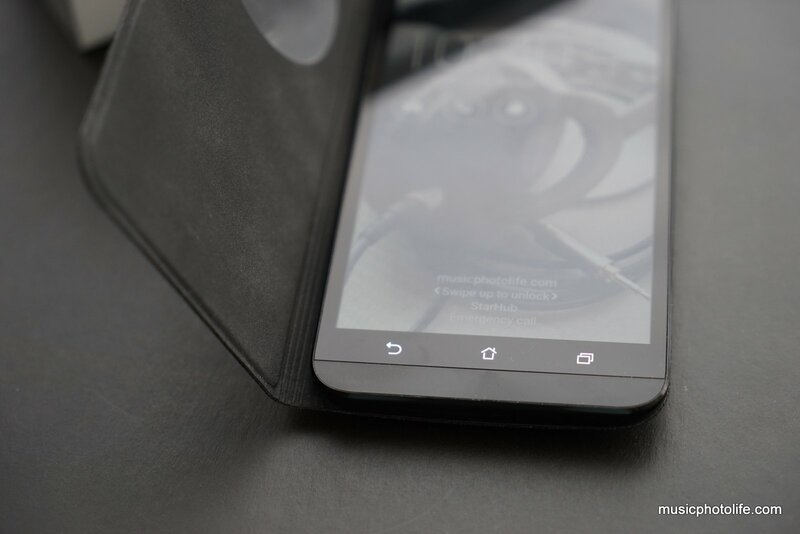 In this post, I am going to share with you the many features which led to consumers – myself included – choosing the Zenfone 2 to upgrade instead of the other brands. There are three Zenfone 2 models and 5 variants available in Singapore. I always prefer higher-spec smartphones due to my usage demands. Speed of the UI, long battery life, massive storage are my criteria. Good pre-installed apps are also in my consideration, because pre-installed apps work better than third party. After reviewing the top-model Zenfone 2 ZE551ML, I am convinced that my next premium-spec smartphone need not be premium-priced. 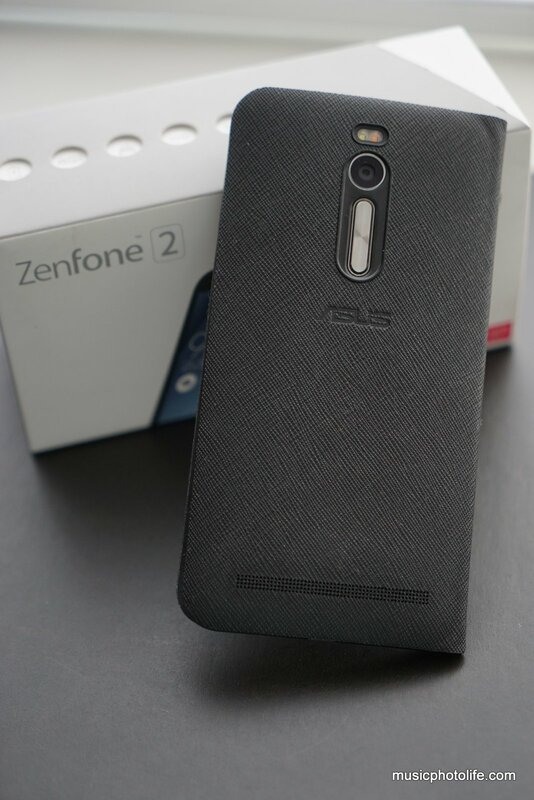 There are so many reasons why Zenfone 2 could be my next smartphone. Pardon my long posts, because there are simply too many features to share (which is a good thing). The Zenfone 2 might not use premium metal for the body, but your hand will love how the curved back contours with your palm comfortably. The review unit has a brushed silver plastic rear cover to mimic a metal look. The interchangeable rear casing negates the need to over-protect your rear phone, since you can easily replace it. Having said that, the front edges are easily bruised and scratched. ASUS should have used a more rigid material. The 5.5-inch screen might be slightly large for most consumers, but having a larger screen means you can see more clearly, and 5.5-inch is still a good size to manage. Besides, ASUS has the one-hand operation feature to improve usability. I cannot stand laggy UI, which is why I favour HTC Sense UI. But Zenfone 2’s improved ZenUI seems just as good! After 2 weeks of review, the UI remains smooth, apps open fast, tap actions are responsive. The generous 4GB dual-channel DDR3 RAM is probably a huge contributing factor. 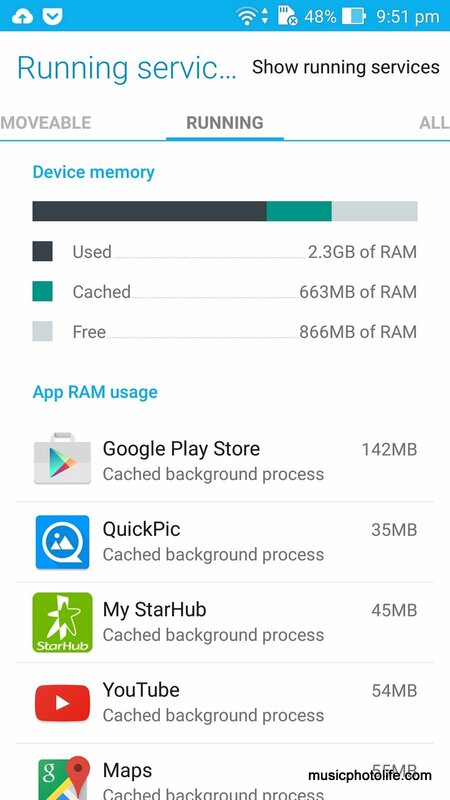 You might think that 4GB is an overkill, but as I was regularly monitoring the RAM usage, I am surprised that the Zenfone 2 is often using more than 3GB, which is a good sign of maximising the RAM for performance. 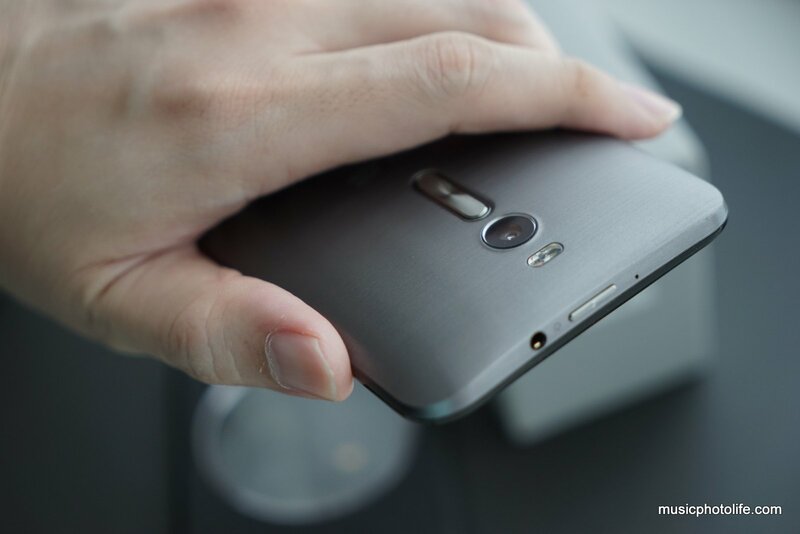 Zenfone 2 comes with preset gestures which you can enable individually or assign to launch a different app. 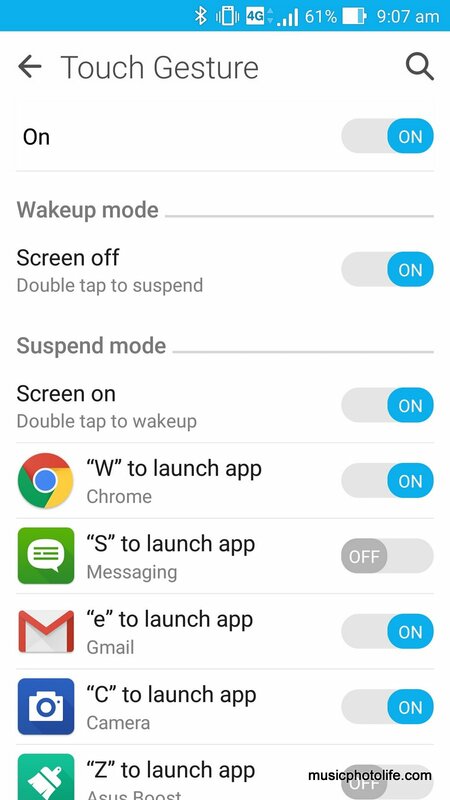 Double-tap the screen to wake up or sleep. Draw a “C” on the blank screen to start the camera. Double-tap the home button for one-hand operation. I do find sometimes the gesture does not work, perhaps because the ambient sensor did not detect sufficient light and thinks the phone is in your pocket, in which case the gesture is disabled. Zenfone 2 is fitted with 3000mAh battery, and if you enable aggressive battery saving, the phone can last beyond one day. When I choose Balanced Mode, the battery life is no different from HTC One M9. While it is possible to achieve a slower battery drain by reducing background apps during standby, you will not receive notifications in real time. In that aspect, Zenfone 2 provides settings to let you pick the apps that you will allow background tasking. I can charge the Zenfone 2 to 60% in 39 minutes. Only the higher-end Zenfone 2 models come with the fast charger, but you can also use Samsung or Qualcomm Quick Chargers. 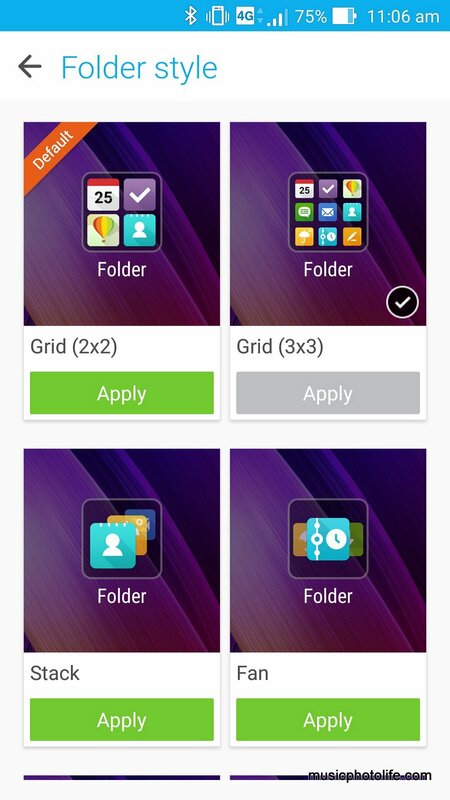 Like the original Zenfone, the new Zenfone 2 comes with 4 useful apps that interacts with other devices easily. PC Link allows you to mirror the Zenfone 2 on your PC via USB or WiFi (the refresh speed depends on your connectivity). Remote Link pairs to your PC via Bluetooth of Wi-Fi, and once you pair it, you can type and control the mouse and music player using your Zenfone 2, as well as your slide presentation. Share Link is an app that lets you send and receive files over-the-air without having to do longwinded pairing. Party Link is similar to Share Link but allows you to send files to a group of people at the same time. 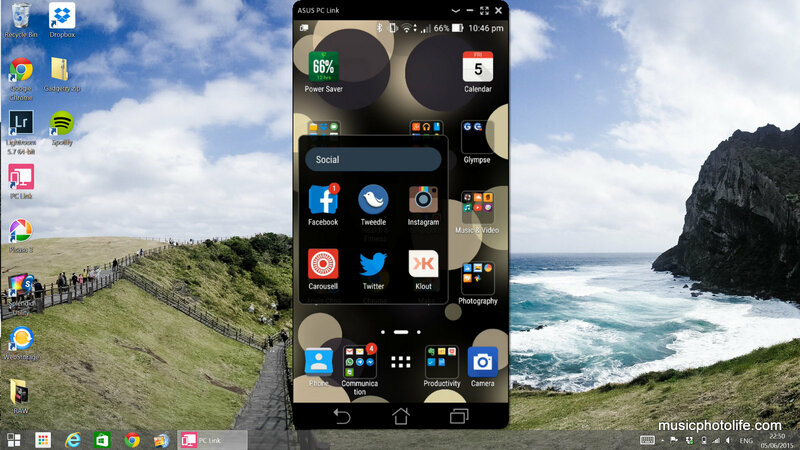 PC Link is very useful if you are constantly on your computer so you can interact with your Zenfone 2 using keyboard and mouse without touching your phone. Remote Link is also great especially with Windows tablets, it is easier to type from your smartphone than the on-screen keyboard. Zenfone 2 has a loads of camera modes, some of which are rather useful. Interestingly, some of these modes are also available for front-facing camera. Manual mode: you can manually adjust shutter, ISO, white balance, focus. There is also live histogram and 4-way leveler to help you achieve the perfect shot. You can also adjust Saturation, Contrast, Sharpness, Noise Reduction, Backlight, Detail Enhancement in this mode. Beautification: this mode beautifies your face by sharpening the chin, lightening your skin tone, make your eyes bigger, and has real-time live preview to see the effects before you hit the shutter. 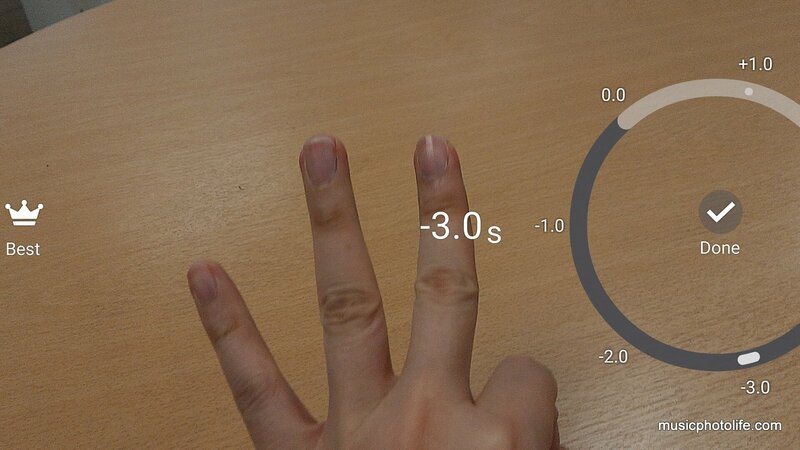 In this mode, you can set the self-timer up to 5 seconds just by sliding the shutter button. As the countdown starts, the shutter button slowly slides back to the starting point, and you can disrupt the countdown sequence just by sliding or holding the shutter button. Super Resolution: lets you generate up to 51MP extrapolated image, with noticeably additional details. All Smiles: the camera snaps 5 images and selects the best image with all smiling. Depth of Field: creates a fake bokeh to blur the background. The quality is not as convincing as HTC One M8. Selfie: this is different from the front-facing feature, where you pick the number of faces that you want to capture in the photo. Once the camera detects the number of faces, it will fire 3 shots. This is useful when you needed a self-timer. 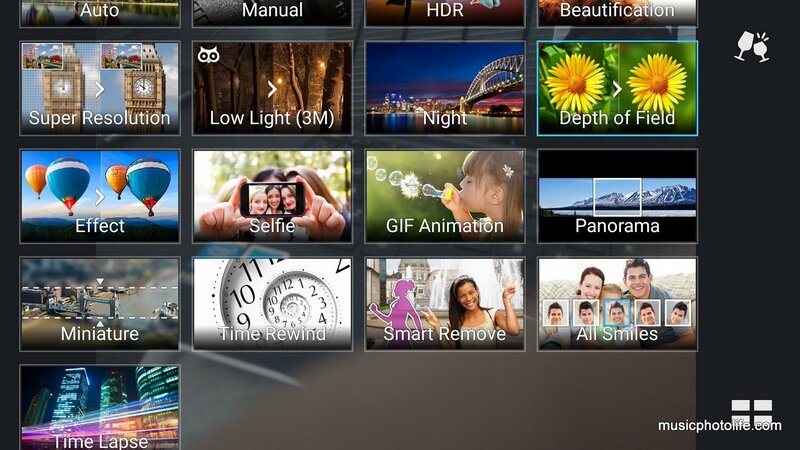 Selfie Panorama: a feature taken directly off Samsung, but ASUS did not implement this as intuitively as the competitor. Zenfone 2 requires the user to pause at the intersection points before the camera snaps and stitches the panoramic images. Time Rewind: the camera captures images 3 seconds before you press the shutter and 1 second after you press. From the results, you can choose your favourite image, save all, or even generate animated GIF. Time Lapse: now you can create fast-motion videos easily with intervals from 1 to 5 seconds. ASUS is careful in not over-processing the images in Auto mode. As a result, images appear rather noisy, but I like that it retains image and colour details even in low light. Exposure is on the conservative side, resulting in slightly underexposed images. You can override the output by increasing the exposure value (EV). Images below are shot with optimisation disabled. This is one killer feature that multiple phone users will love. 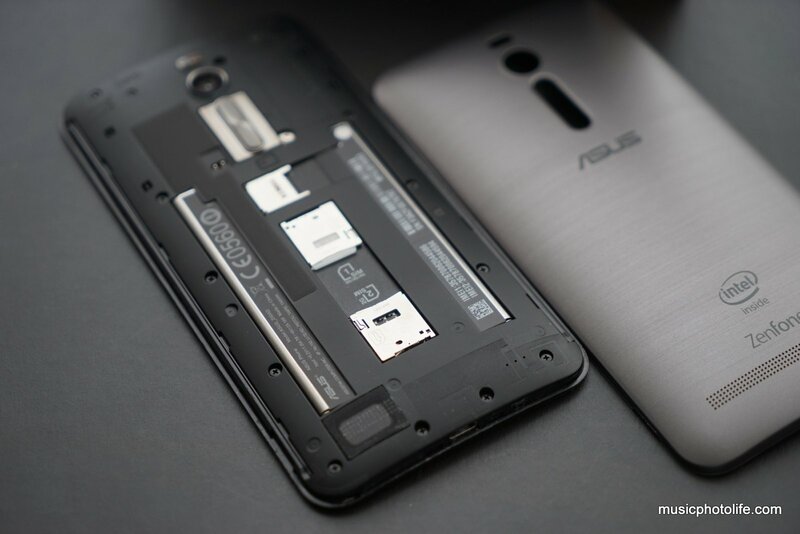 No longer do you need to carry 2 phones because Zenfone 2 supports dual SIM cards. A small issue though: the second SIM slot only supports 2G, which is a pity. OPPO R5 actually supports 4G on both SIM slots, although you can only use one SIM for active data connection at any one time, but that is more convenient than having to swap SIMs. ASUS is very aggressive in releasing software updates. During my short 2 week review period, I already received 2 updates. There is also an active online community forum where users share feedback and issues, many of them are promptly resolved with regular firmware releases. What’s Next: ASUS What’s Next app is unlike other calendar apps. Instead of showing your agenda, the app intelligently highlights the important details. For instance, if an appointment has changed timing or location, What’s Next will display that in bold. Do It Later: When you receive incoming events (calls, messages, emails, website), you can auto-create a task which will remind you later to take action. This integrated approach is easier than you having to open another app to manually type a reminder. 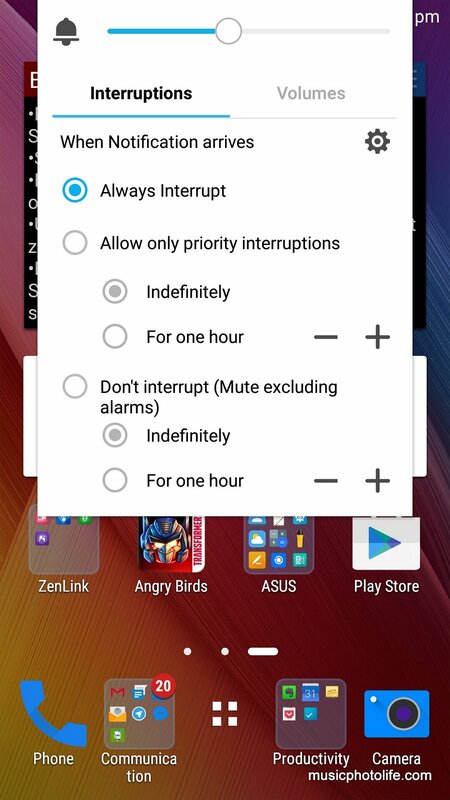 Do Not Disturb: Zenfone 2 has built-in feature to let you manage if you allow events on your phone to disrupt you. You can set the disturb rules against reminders, alarms, calls, messages, and set disturb rules by days or hours. You can also set ad-hoc “Do-Not Disturb” from the volume control pop-up, which I thought is really useful, say when you want to be undisturbed for the next 60 minutes. Gallery App, Photo Collage and Mini Movie: The ASUS Gallery app is enhanced to let you generate photo and video collages easily just by picking the photos and pressing next. You can also open the collage or movie apps directly and create content. Easy Mode Launcher: This launcher is useful for consumers who prefer a simpler layout with large icons and more intuitive navigation. Consumers like the elderly. Adjust Screen Colour Tone: This feature may seem trivial, but many people often complain about their screen appearing bluish or yellowish. 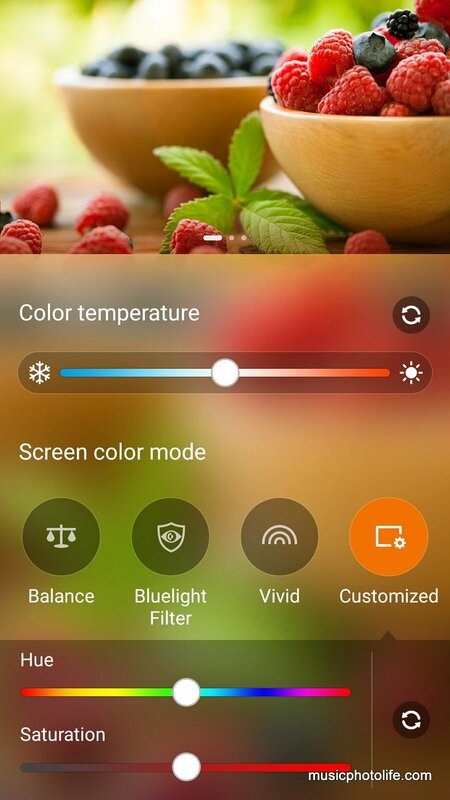 ASUS Splendid app allows you to adjust the colour temperature, hue and saturation to your content. MyASUS, ASUS Support: If you need assistance with the Zenfone 2, just run MyASUS app which easily lets you make a call to service hotline, track your repair status, find service locations, and search ASUS product information. 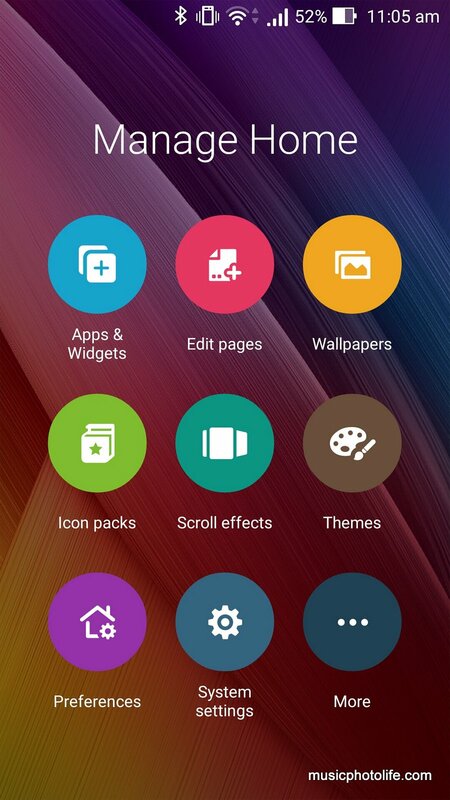 Similarly, ASUS Support app offers you guide on how to use your Zenfone 2. 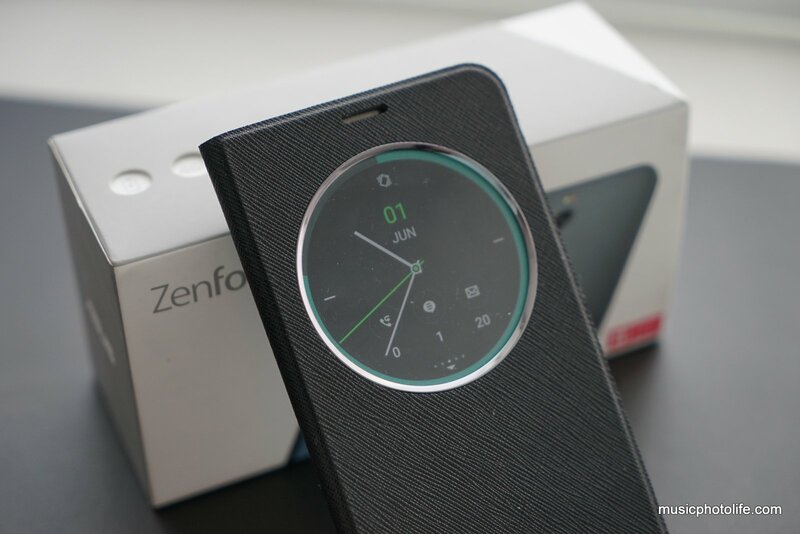 ASUS Cover: When you fit an ASUS Cover, you can interact with the round cover screen when you enable apps like calendar, clock, camera, flashlight, weather, music. You can read message and emails via the window. It is largely functional at this point, without much bells and whistles, but hopefully future updates will beef up the capabilities. There are a few things that I don’t quite like about the Zenfone, and one of them is Audio Quality. No doubt the Zenfone 2 audio volume has improved compared to previous-generation Zenfone which is too soft to hear anything in outdoors. However, I am not a fan of ASUS AudioWizard processor where the preset sound modes do not bring out the audio quality. But given the price value of the Zenfone 2 with so many other great features, I am ok to let it off. Another minor quibble is the sharing of notification tone with the SMS Messaging, which is odd. I would very much like to have a different notification for my phone operation and my incoming SMS. But these days I completely turn off the audible tone on my phones ever since I use a Google Wear smartwatch. 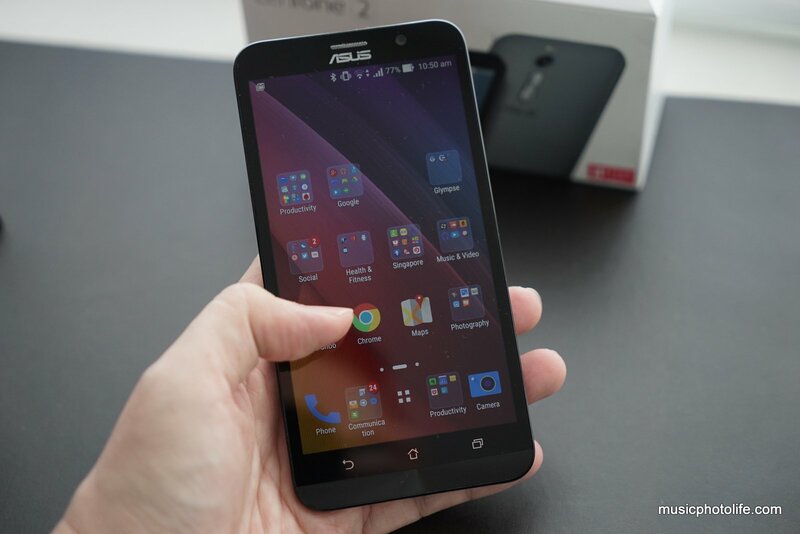 I have reviewed multiple ASUS smartphone devices over the years. And too often I find their devices lack the competitive edge. When they announced the first Zenfone series, I thought they stood a good chance with the attractive price. Now with Zenfone 2, I am very pleased with the performance and features. At a price below S$500, the decision is easy on the pocket. Pingback: OPPO R7 Review - Music.Photo.Life. Pingback: ZenFone Selfie vs. Zenfone 2: Which is Better?